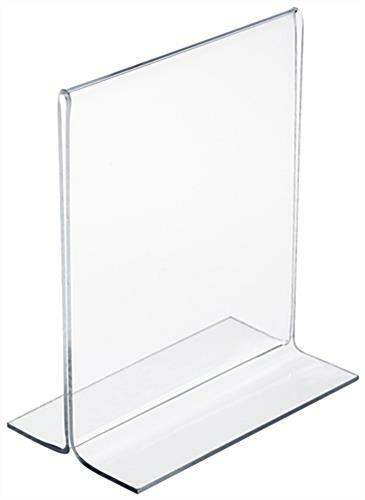 This menu card holder features a unique fold over design made of one continuous piece of acrylic. The bottom and sides are open allowing users to change out signage in an easy manner. 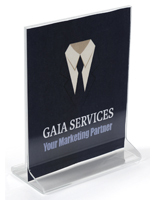 This menu card holder, table tent, is intended for use with 4"x5" signs. 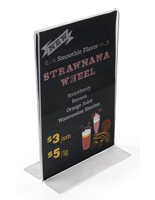 This table sign is easy to update by sliding the old graphics out the side and inserting new signage through the bottom. 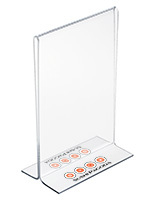 Each menu card holder is vertical providing a premium viewing angle. 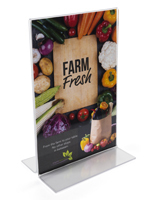 Restaurants and bars purchase this table tent by the thousands to advertise throughout their establishment. 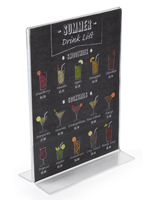 Use this menu card holder, also know as a table sign, to advertise drink and dinner specials. Patrons notice signage that is left on the tabletops and often inquire about promotions. 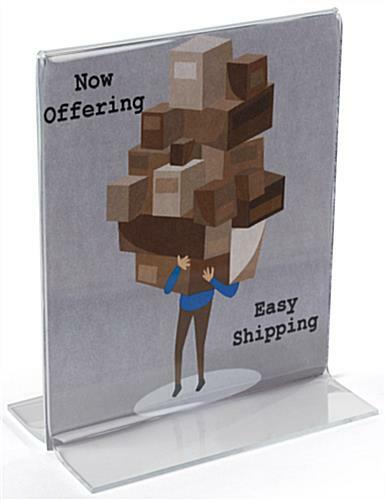 Place this menu card holder in the center of a table for use as a double-sided frame. 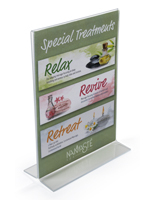 This table sign frame can accommodate two sheets of paper placed back-to-back. 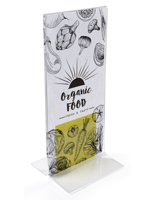 This menu card holder is easy to maintain with an occasional damp cloth to remove dirt and debris. Silkscreen imprints are also offered with this table tent for an additional fee. For further details please send all inquiries to the email address listed above. 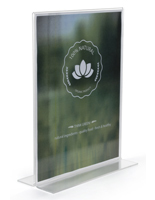 This menu card holder with custom imprinting will leave a lasting impression on all viewers. This frame works perfectly to hold scripture cards I paint, print and sell at itstheword.etsy.com.